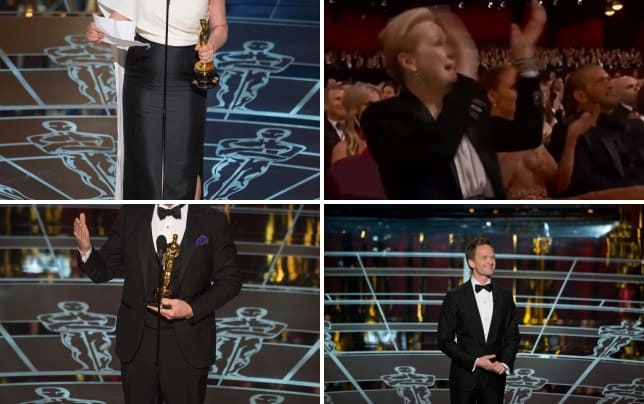 15 Best 2015 Oscar Moments: Patricia Arquette Demands Equality & Much More! The Oscar winners have been announced! But the performers and movies that won Academy Awards are not necessarily the top sources of discussion around the world today. These 15 Oscar moments, however, are most definitely buzzing. Which Oscar moments truly got us going? There were many, and one of them came from one of our favorite The LEGO Movie quotes! One Academy Award winner had us calling our parents. Also, we salute host Neil Patrick Harris’ best quotes, and watch The Theory of Everything online and the Oscar winner for that movie gets the award for most enthusiastic of the night! Click through and discover the 15 most memorable moments from the 2015 Oscars.